Re-prints of vintage patterns are happily available everywhere nowadays. Vintage re-released offerings from Burda are fewer than other pattern companies, and they are frequently quite challenging but awesome styles! My Easter dress this year was one of Burda Style’s re-prints that have been out for a while now. 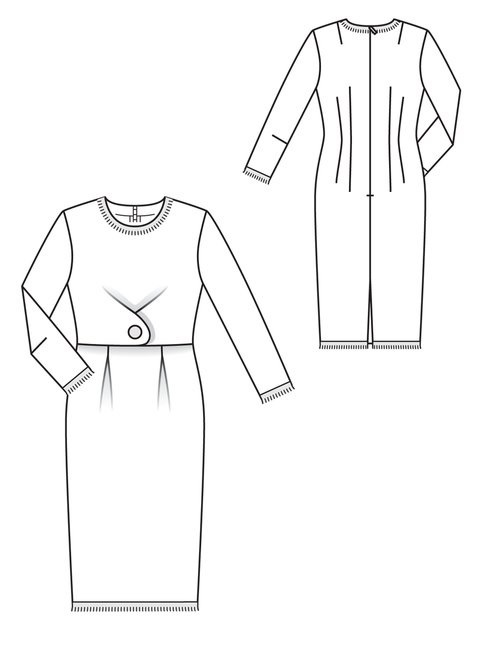 Ever since I dove into Burda patterns in 2013, this pattern has been one I’ve been wanting to sew – now I finally have made it, and I love it. It has Paris-influenced details and a style that is put together yet deceptively easy to wear. This is a year 1960 design of a suit jacket and pencil skirt in the form of a one piece dress…made boldly bright and cheery by using a fun bouclé that happens to remind me of confetti. Confetti for Easter? Why not celebrate! This makes project number two for the Easter Spring Dress Sewalong 2017. 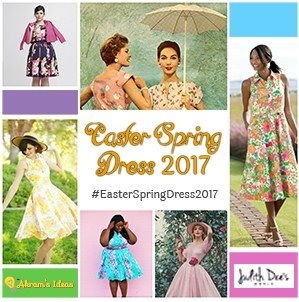 However, for those of you that follow my blog, you might have seen I have a ‘tradition’ for the Easter outfit I sew for myself each year. I think it is an interesting challenge, but I know it probably just sounds weird and even quite quirky. Starting with my 1929 Vionnet-style dress in 2013, I have been going up in decades (closer to modern times) for each successive year’s Easter dress. 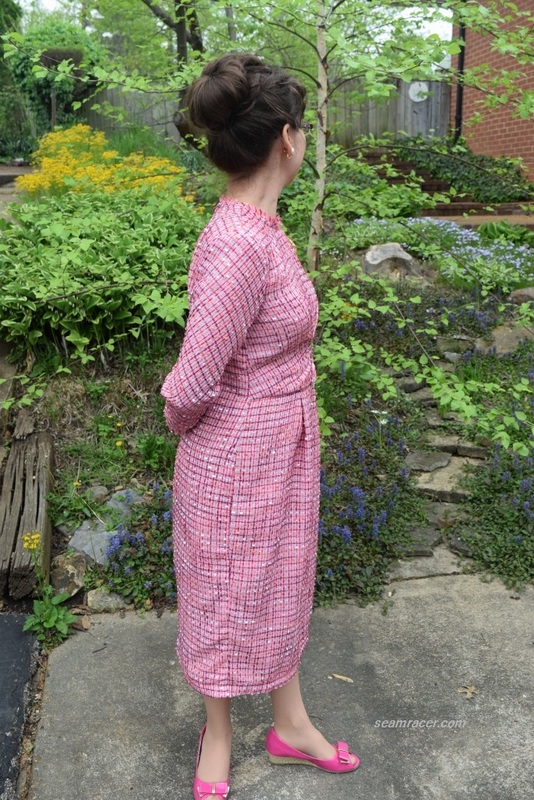 For 2014, I made a silk 1935 dress with a matching slip, for 2015 I sewed a 1944 rayon dress, and then in 2016 I made a 1954 shantung dress and reversible jacket. Whew! This ‘tradition’ did make it a bit easier for me to choose what 2017’s outfit would be – a definite 60’s garment. 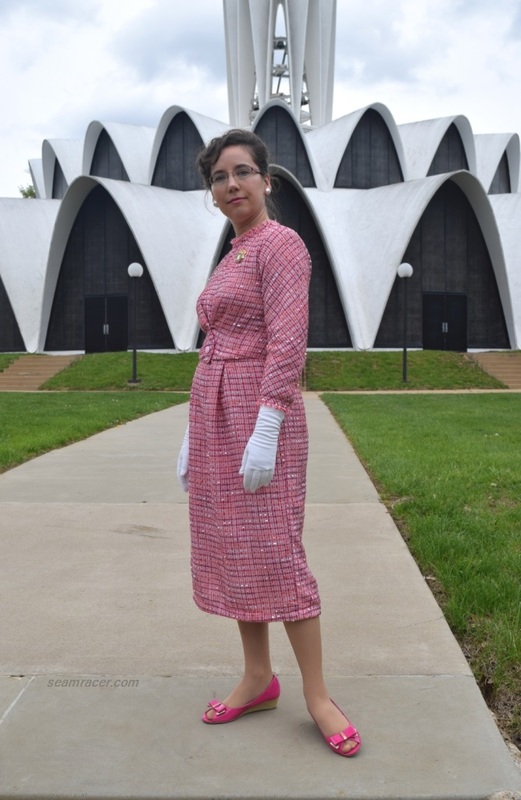 I blew away a whole lot of things I’ve been waiting to ‘check off’ on my sewing ‘bucket list’ by making this particular Burda Style 1960 garment, though. It’s from a year which I have not yet sewn from, it is made of a pattern (and fabric) I have long been wanting to use, and it’s a one piece dress to make things relatively easy on myself this year. 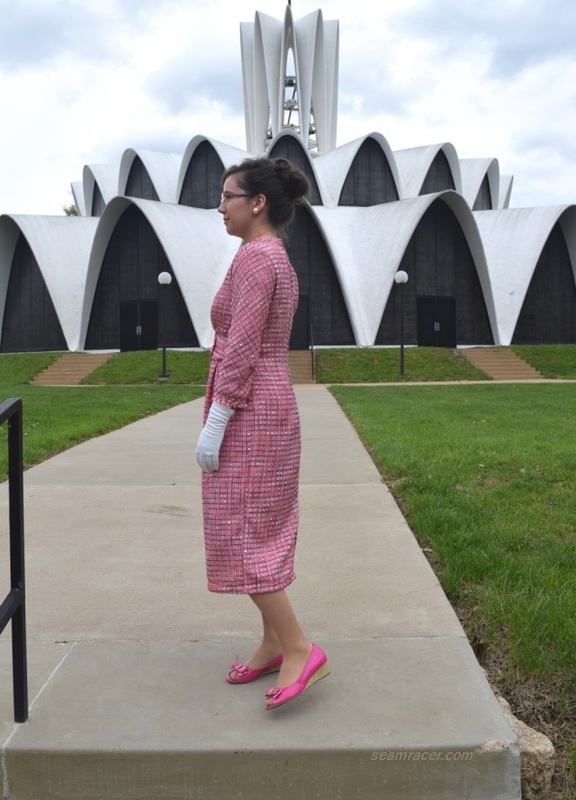 Our church’s 1960 era Mid-Century Modern architecture matched perfectly with my outfit anyways! Here’s to a doubtful but hopeful plan that I might actually find a dressy outfit from the 1970s which strikes my fancy so I can keep my Easter sewing ‘tradition’ going. NOTIONS: Thread, bias tape, interfacing, a zipper, a button, and shoulder pads was what I needed – all of this was on hand already. The single fake closure button on the dress front is from the stash I inherited from hubby’s Grandmother. TIME TO COMPLETE: This was finished on April 12, 2017, after about 20 (maybe more) hours to complete. 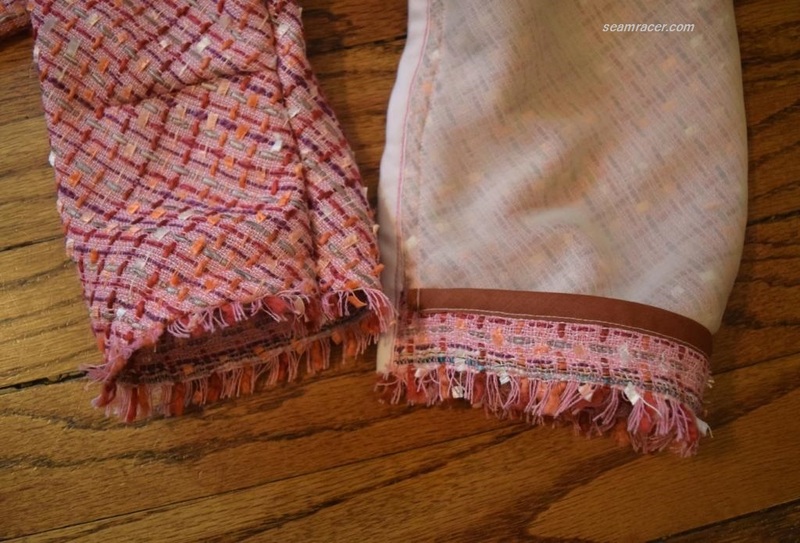 THE INSIDES: This fabric shredded and un-raveled like a sewist’s nightmare! Thus, all the seams are bias bound. TOTAL COST: Ah, here’s the sweet part! The bouclé was bought when a Hancock Fabrics store was closing in 2015, and so I bought several yards of this for just under $2 a yard. The lining was recently bought at my local Jo Ann’s Fabric Store on clearance for about $5 a yard. Put all of that together and this dress cost about $15. Awesome! I do have one yard of the confetti bouclé leftover, so unless I share it or ‘donate’ it towards one of the projects of others I know who sew, you’ll probably see this again. So much about this outfit screams Coco Chanel to me. I mean, my ensemble is primarily pink (even my shoes), the fabric is a tweed-like bouclé, it’s a suit with fringed hems, and the Burda magazine summary says this dress has a French couture influence. How much more Chanel can one get! (If you’d like more Chanel pink inspiration through the decades, please visit my dedicated Pinterest page.) In my own country, the famous first lady Jackie Kennedy wore a Chanel pink suit for one of the most iconic moments in Presidential history, 1963. 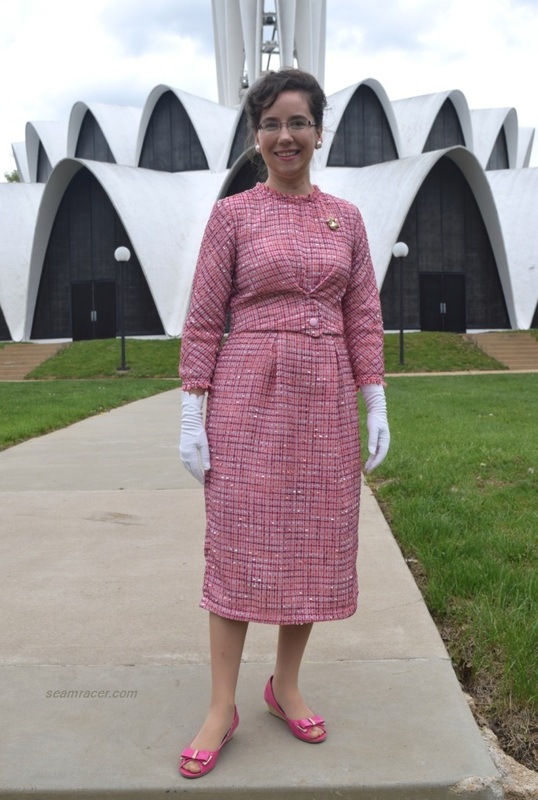 I did find that this particular waist tab styling isn’t really new, though, it can be seen in earlier decades looking at both the cover of Butterick #4022, year 1947, and a 1956 photo of Ghislaine Arsac. Now, as for any Burda Style pattern, printing and/or tracing is necessary to have a usable pattern to lay on your desired fabric. My pattern was traced off of the downloaded and assembled PDF bought at the online store but if you have a magazine issue, use a roll of medical paper to trace your pieces from the insert sheet. 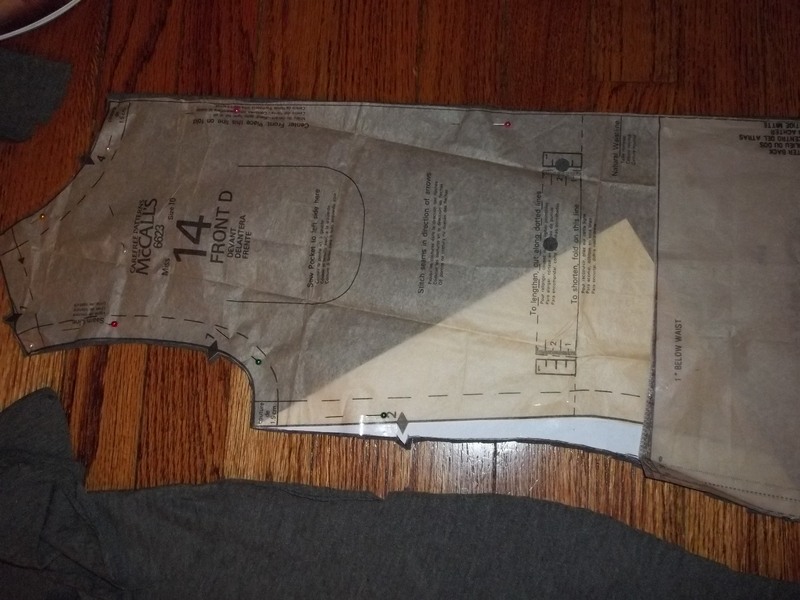 It’s at this preliminary step that you pick out your proper size and add in your choice of seam allowance width. A scissor with a magnetic ruler guide helps immensely to quicken along the step to getting a finished pattern prepped. Sorry to repeat something you might already know, but this is just an “FYI” for those that don’t know. I found this pattern’s sizing to run on the large size, but perhaps this is because of the weight of material I used. This confetti color bouclé does not hold its own shape or keep its own body. A fabric that does both of those things would be the best way to really achieve the right fit and fake bolero appearance. I know the pattern’s fabric recommendations say the same thing. I’ll admit I often disregard such guidelines only to end up with a great finished garment, but they are really is important here. Otherwise this dress is a more of a trick to make than it has to be. Perhaps a boiled wool (lined, of course) or a suiting blend, might be ideal…however, the fabric recommendations also ask for a fabric which can fray easily. As of yet, I don’t understand what would be a fabric that is the best of both worlds. As long as I made it work to sew this pattern out of my lovely novelty suiting, all is well. You see, I had been saving this up specifically to make a suit dress from the minute I laid eyes on this in the fabric store. Some pattern and fabric pairings are just meant to be, like a match made in heaven. Of all the features, the front fake bolero ‘closure’ at the waist takes the cake to this design. It is neat, but was so tricky to figure out and actually get it to appear as a bolero. I whizzed through the rest of the dress, otherwise, but the front probably took up half or 1/3 of the total time spent. What was really hanging me up was where to snip and what to do with the ends of the pleats which come into the dress from the front waist tabs. As I figured out, they get tucked into the facings of the tabs, pulled down (more or less) on each side of the tabs. I would have taken a picture of what I was doing at this step, but unless you make this dress, it’d look like mumbo-jumbo to show you. Nevertheless, once I had the front mock closure reasonably correct, I further figured out that the real trick is to pull up the 2 inch wide seam allowance to the front waist and connect it to the top of the tab facings. This way the bodice sort of overhangs onto the skirt, creating the appearance that there is a jacket over a skirt. Only when I turn to the side or the back then someone might go, “…wait, what?” What a tricky deceiver! 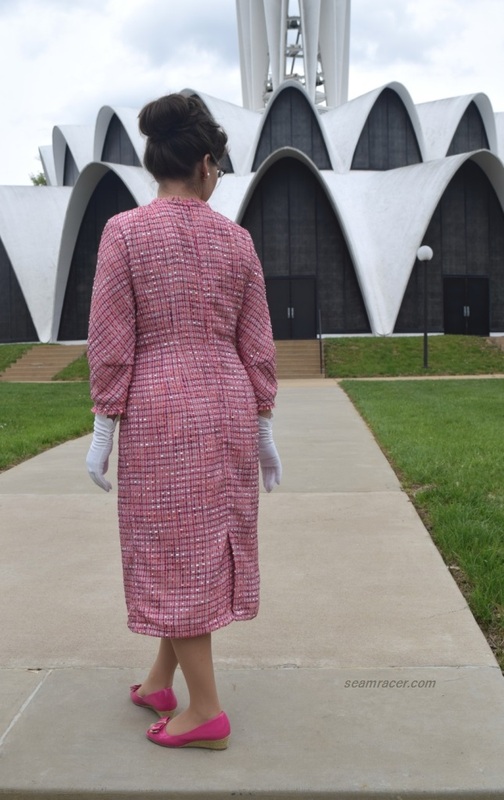 The back part to this dress is very basic to vintage 50’s and 60’s patterns, and even modern ones for that matter, but I find it to be shaped very well. It is common for me to adjust the darts to these type of dress backs. I almost always need to fix the bootie and/or the shoulder points of the darts…but not this time. This was quite a relieving change. As I said above, the pattern runs a bit generous so perhaps this was the reason for my vacation from fitting adjustments. There were a handful of relatively small changes I made to the design and/or layout. I straightened out the skirt side seams – originally they tapered into the knee for something like a wiggle silhouette. No, thanks! Rather than a slit in the back of the skirt I made the classic kick pleat vent. I raised the shoulder seam on the bodice (making room for shoulder pads) and added in 5/8 inch to the sleeve/dress armsyce at the armpit point so I would have “reach room”. 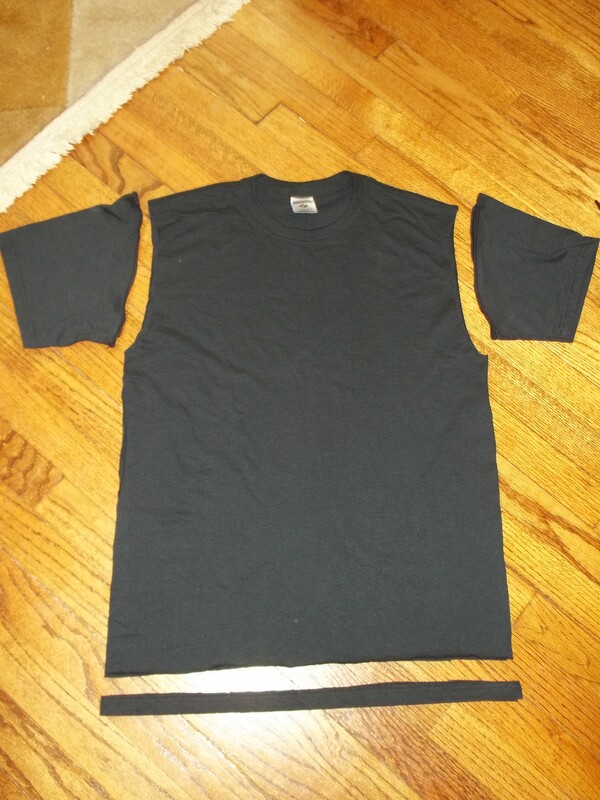 I also cut the sleeves on the bias for more interest in the directional bouclé and for more “reach room”. The sleeve length turned out quite long (as in bracelet length) so I shortened them by one inch. Just to be on the safe side, I added in an extra inch to the length of the hem of the skirt bottom. I did not do a separate lining for the entire inside, but cut out full pieces (except for the skirt front, which is its own piece) to back the bouclé and be sewn into the dress as a whole. Finally, rather than cutting strips of fabric, shredding them, and finishing off the edges for the sleeve hem and neck, I merely used the fancy selvedge to the fabric. It worked perfectly to use to selvedge, and I think it looks better and is more stable than using frayed fabric strips. I only put the frilly edging on the sleeve and neck (not on the skirt) because (again) I was trying to keep up the whole mock jacket appearance. Oddly, what most impresses me is something you’d never see unless you make this dress or wear it for yourself – the inner lining. The lining skirt has four darts and is significantly smaller than the fashion fabric skirt with its two box pleats. This design ingeniously keeps the box pleats loose enough to keep a lovely loose shape. It’s just like the 1950s and 60’s to have this ingenious fitting technique that’s so understated and disguised. There is so much more than meets the eye to vintage patterns, and as long as a re-issue is decently ‘true’ to its original design, then more amazing techniques can be done by others to sew one’s very own special design, too. The difficult but successful process of making yet another Burda vintage re-print has given me a very comfy and cheery dress that I am just plain happy wearing. With my adjustments, I am not confined at all in this dress so I can walk and bend fully (to find those hidden Easter eggs). The design makes me put together with one pull of the back zip (so simple). Finally, the fabric is a lovely standout mix of colors (just like how spring is to the floral world). So many times, being in a suit dress doesn’t mean all of those things. Until I started sewing my own garments did I realize you can have the best of both worlds, if you plan a sewing project just right. In Vogue magazine for February 15, 1954, page 84, Chanel was quoted as saying, “A dress isn’t right if it is uncomfortable…A sleeve isn’t right unless the arm moves easily. Elegance in clothes means freedom to move freely.” I like that. Easter is a time to celebrate and appreciate family, nature, and blessings, among so many other things, and I didn’t want what I was wearing to get in way of doing all the ‘good stuff’ to do. Another Easter might have come and gone, but now I’ve got memories leftover as well as a great dress to wear again and again. I hope you, too, had a wonderful holiday! I recently found a very interesting math equation that produces an excellent result. Here it is: 1 yard of easy care, super soft knit fabric, plus 2 hours of time devoted to cutting and sewing, equals 1 very happy Seam Racer, a.k.a. Kelly. At that time, I needed a no-fail, instant satisfaction project which was a change out of the ordinary for me, and this skirt was my lucky number. Besides, I had been wanting to make my very own version of the “high-low hem” style that has been out since the first spring fashions emerged earlier this year. The fact that I have been noticing how many 1920’s and early 30’s styles had the same “high-low hem” made my determination only stronger for me to sew something with that fashion element. A few of the Pantone Fall 2013 colors are included in the tribal Indie print of my skirt – linden green and samba especially, among other background colors of turquoise and navy. This skirt, although it didn’t call for much skill, makes me feel SO good, it’s amazing! I haven’t made a new skirt for my wardrobe in so long of a time. I intended on turning my skirt into a one piece dress by sewing a top to the waistband elastic, but the versatility being able to change top colors is much more fun than having another dress. FIRST WORN: I felt so good in my new outfit, hubby suggested taking the family out for a meal of food we don’t normally eat, but love: pizza, wings, potato skins, and root beer. Yum! The skirt portion of dresses A, C, and E was used and adjusted to be turned into my easy knit skirt. Firstly, I straightened out the top of the skirt front pattern so it would go straight across. 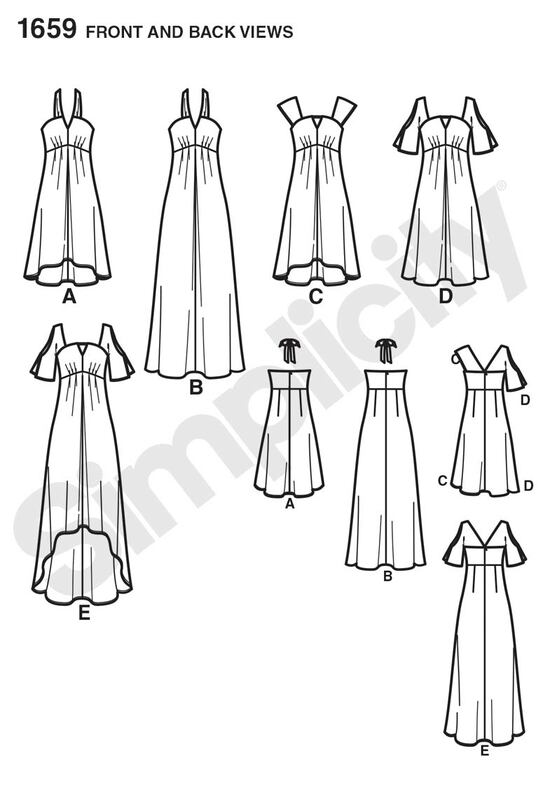 On the dress, it arches up to the join the bodice center like an upside down V, with five tucks along the front. I kept 4 of the tucks for my skirt front, the two on right and two at left, but eliminated the big tuck at the center to simplify things and keep some fullness. Also, I re-drew a new length onto the pattern. The longest length was too long, and I didn’t want to short version, either, so my skirt is in between those two lengths. With all these changes, I still cut out my correct corresponding size. Only one yard (60 inch wide, and folded selvedges in at the center) was just enough to squeeze the two pattern pieces. Doing the waist band was fun! There were at least 10 different fashion colors of elastic to pick from at JoAnn’s, and I can’t wait for another project which gives me the opportunity to use a different elastic color as well as this interesting sewing technique. All you have to do is cut your elastic to a comfortable measurement around your waist, add enough (two inches maybe) to securely sew the ends together, then pin and stretch both skirt and elastic! 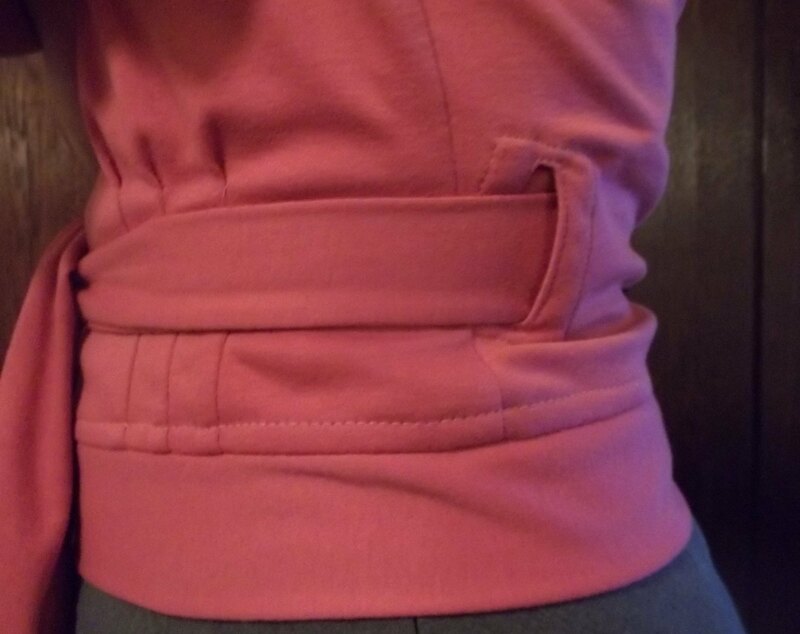 I know one thing…I have not yet figured out how to do a waistband like this without having someone with me to help me. After I pinned the sides, hubby was sport enough to hold my skirt and elastic stretched out together so I could work at pinning the waistband in place. Two rows of zig-zag stitches later, I was done and amazed – its nice to have an easy and uncomplicated project every so often. 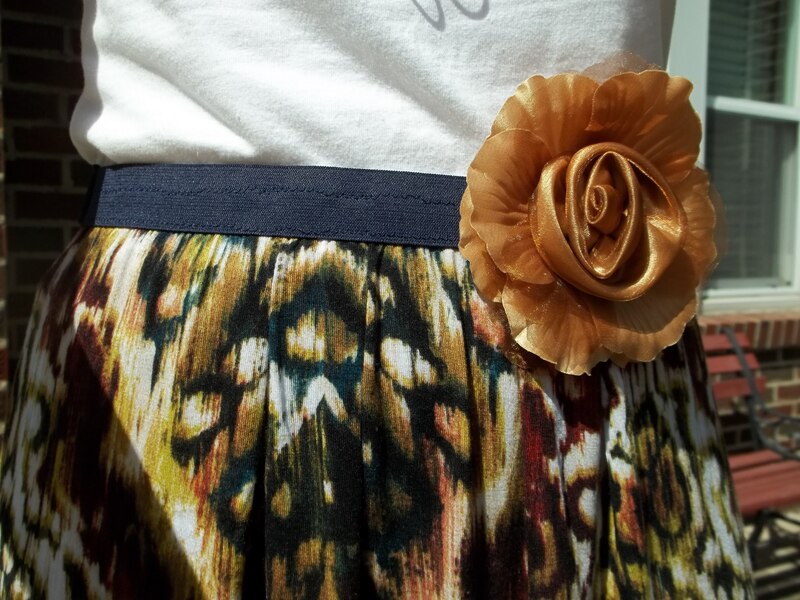 By the way, the flower isn’t part of the belt – it just clips on for an easy decoration. Look at the waistband picture above at right – there is a side seam going through the design, I just matched it up really well. The other side isn’t matched up as well, but I’m o.k. with that because my finished project is just too good for me to care. A historic village in a different part of town was the perfect spot for a Sunday afternoon of letting our little tyke play in the dirt and take some photos. 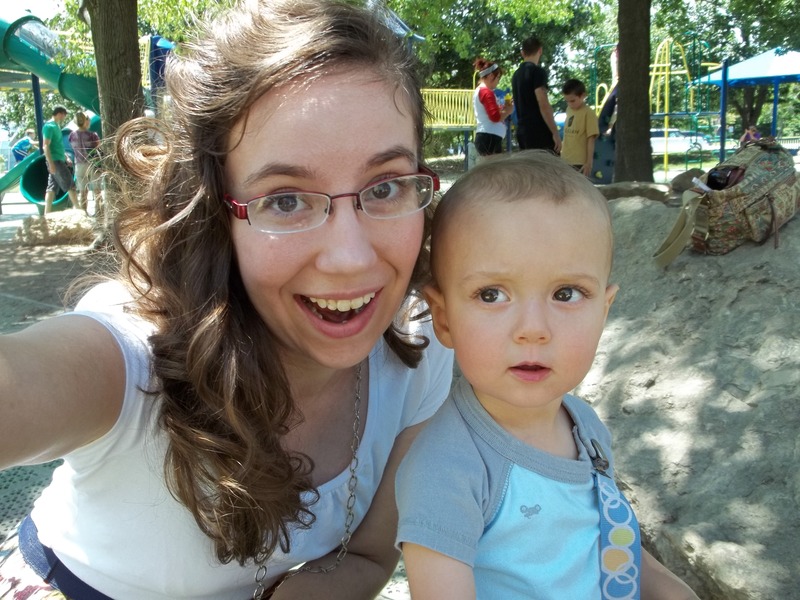 I don’t know if I was enjoying being out more than him, but the picture below shows our little guy giving me quite a look. Just HAD to add this outtake – it’s so cute! 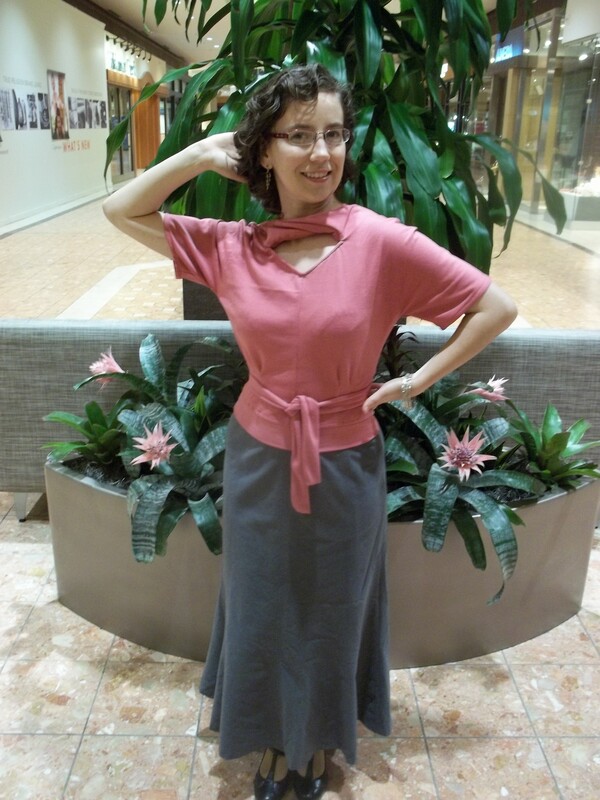 I would like to make one last observation regarding the pattern, Simplicity 1659, which I used for my easy knit skirt. I couldn’t help but see a resemblance between the long style dress with the open sleeves (view E) and this original Chanel creation from the 30’s (see pictures below). I makes me wonder about the amount of fashion that comes around every so many years and sneaks its way back in without people ever suspecting. 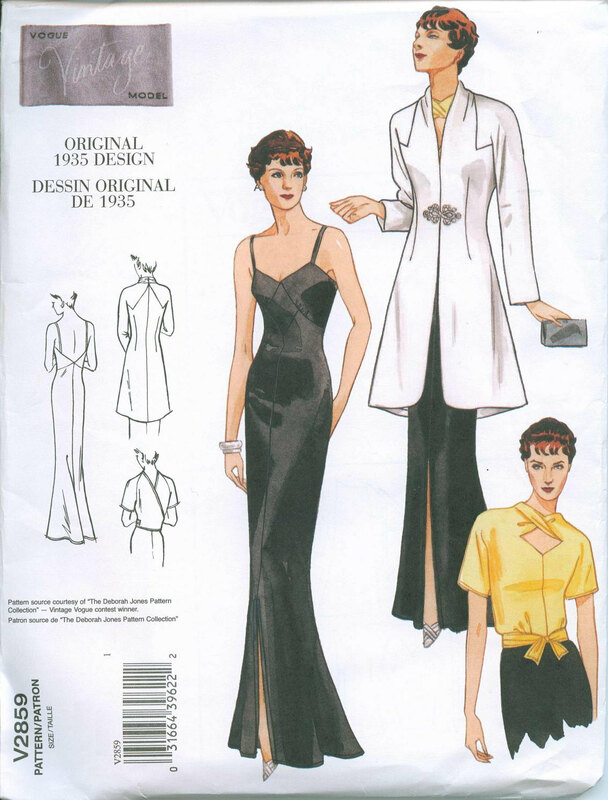 There is a temptation for me to adapt Simplicity 1659 into a Chanel imitation, but, if I do, it won’t be anytime soon. So many projects…so little time! Re-releasing vintage pattern 2859 was one of Vogue Company’s best moves, in my humble opinion, and I really enjoy the finished results. My version of the blouse/top from V2859 embodies three of the most popular, most distinctive fashion trends for women in the 1930’s, not to mention the fact my top pays homage to two of that era’s top rival designers, Coco Chanel and Elsa Schiaparelli. NOTIONS: already had the thread I needed and just enough 1/4 pink bias tape, leftover from sewing this mini apron. PATTERN: Vintage Vogue 2859, year 1935, reprinted in 2005. I would like to make the dress, one to use as a slip perhaps or even a satin floral one to wear under my top. TIME TO COMPLETE: finished on Feb. 18, 2013, after about 15 hours of time. Making this took longer than I thought from looking over the assembly, being my first ‘Advanced’ Vogue pattern (the label is really there for a reason). THE INSIDES: Unfinished! The knit I used doesn’t ravel and the top was complicated enough, so…it’s not messy, just not perfect inside. TOTAL COST: Free…the best benefit of using a fabric from one’s stash! I will now show you the 30’s fashion trends of my blouse. 1.) Knits were the trend in an array of solid colors, thanks to the practical luxury of Coco Chanel, who first designed knit suits in 1916, even though Schiaparelli popularized the new fabric. Jersey knits gave 30’s women the chance to be more flexible in their day-wear fashions. A knit suit was much more comfy and easy to move in than a stiff, business wool suit, and 30’s knits tended to be in a brighter palette for new options. Besides, the 30’s ideal was for fabric to “flow” over and “hug” women’s bodies (think of the bias dresses and use of silk), so knits continued the body clinging style further. 2.) Before Elsa Schiaparelli, pink had really not been integrated into feminine fashion quite like it was in the 30’s. Elsa’s distinctive pink color was, back then, labeled as “shocking pink” and was released in 1936 as the shade of her personal perfume box. Let’s say my Vogue top, being a ’35 pattern, could have been made in ’36, out of a more toned down pink, so I would be (historically speaking) quite fashionable. 3.) Low back or V-back tops and dresses were popular on account of sunning/tanning becoming the new look of beauty, instead of a marker of lower social status like previous years. There was now more of a reason to show off a girl’s back, sometimes also the shoulders too! 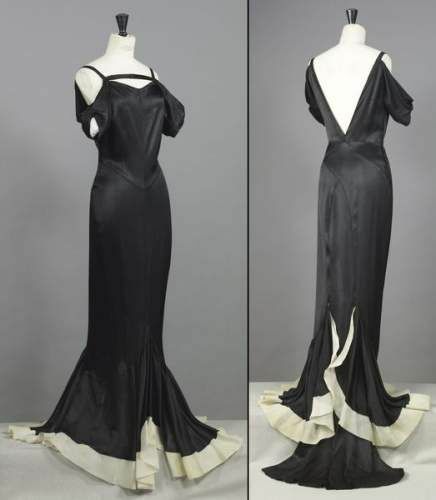 See my “New Year’s Evening Gown” for a deep V-back 30’s garment I’ve made already. Designers of the 30’s were obviously pushing the limits in a different way, a more Greco/Roman way, than in the 20’s. This style is smart in another manner because in a low or V-back clothes you have a visual interest from behind, not just in front, that is eye-catching and fashionable in all eras! The construction of V2859 – as an “Advanced”- was not really hard for me, just time consuming and challenging to the point of actually being enjoyable. I found it quite complimentary for the pattern instructions to take it for granted that I can figure out what I need to do, instead of (like Simplicity) going into a tiresome, exacting, and windy explanation of how to do every step. I feel as if I get to use my sewing skills and knowledge this way. There is no cut intended towards sewers who need thorough instructions. If it wasn’t for the assembly sheet, we, myself included, wouldn’t make half of what we do sew. However, I’m just saying this for other seamstresses who are where I am at with my sewing skills. Beginners would definitely find this pattern confusing, no doubt. This top is the third 1930’s clothes item I have sewn, and now find myself more impressed than ever with the styling and construction details of the era’s patterns. 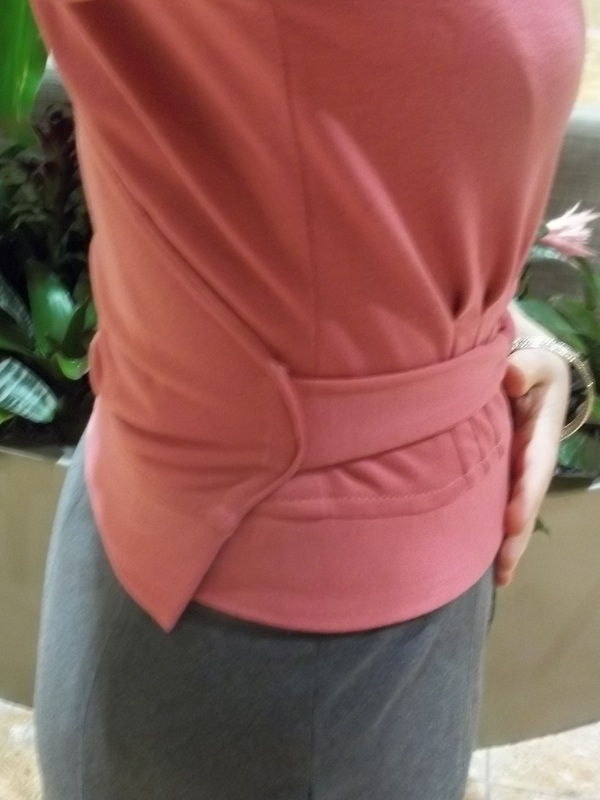 My twist-neck top is a beautiful compliment to the waistline with an emphasis on the hourglass shape. Take note, the sleeves change style if you look at the envelope back: from the front they are kimono sleeves, while from the back they are raglan sleeves. 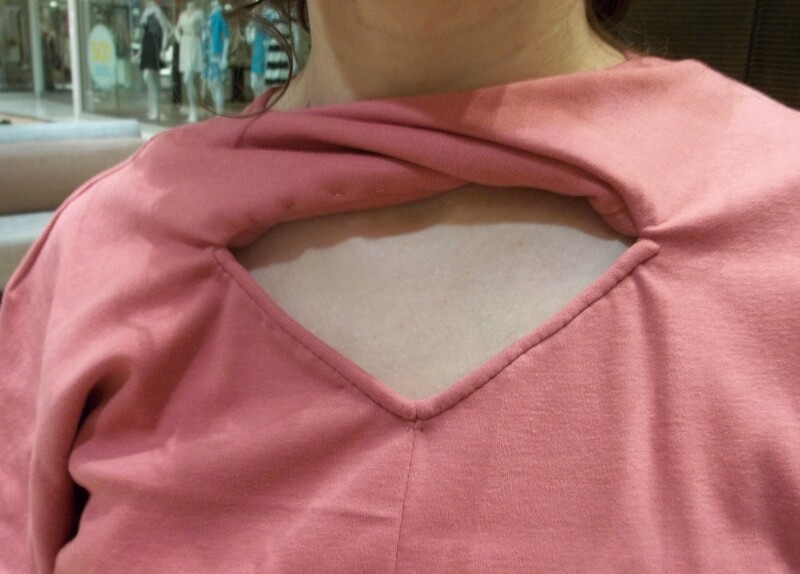 The points where the sleeve seams meet (at the bottom of my neck on each side) was VERY tricky, but it turned out O.K. for me. There were a number of changes I made to this blouse pattern which seem to generally be a good idea as these little points help its fit and appearance. 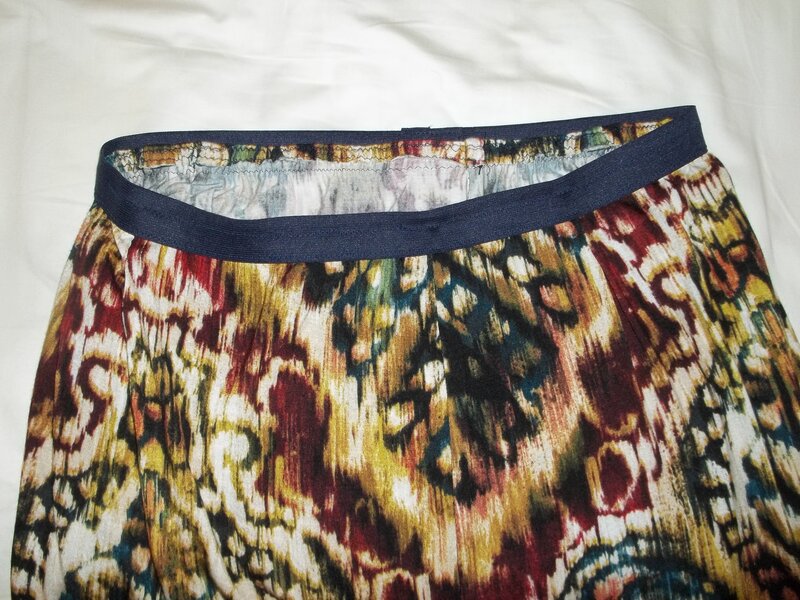 Firstly, making this twist-neck wrap top out of a knit, I went down two sizes…this trick works well for vintage patterns not specifically listing a knit on the envelope back under ‘suggested fabrics’. Secondly, I added a 2 inch band (5 in when I cut it out) to the bottom so that the hem ends at or just below my waistline now. Even if someone DID wear this top over another dress, I still think this blouse ends too high above the waist to look good. By adding an extension, it can now be worn alone as a top with my skirts as well as over a skimpy dress! Then, at the side opening for the tie, I sewed an extra square of fabric onto the inside -with one side open (of course). That way no skin can show from underneath. The two pictures to the left and right show both sides of the bottom half of V2859, letting you see both the details of how it wraps and my finishing touches. Another important change I made was to the front seam and front neckline. The front center seam had to be sewn in several inches from the neckline down to where the darts start. I’m petite and there was too much extra fabric in the bust; bringing the center from seam in made my top fit better with minimal drooping. Later, I also make a skinny strip of bias tubing to stretch behind my neck from shoulder seam to shoulder seam. Finally, I added a bias neckband because the way the instructions said to finish off the small V-neckline were difficult and tacky. Over the rest of the top the stitching is unseen. I think exposed stitching in an obvious spot makes this top look casual instead of dressy. My idea of sewing on a bias neck binding is (I think) much more polished, besides the fact it is so much easier to sew on than achieving a tiny hem. I hand stitched the neckline band on to make sure it was done invisibly. 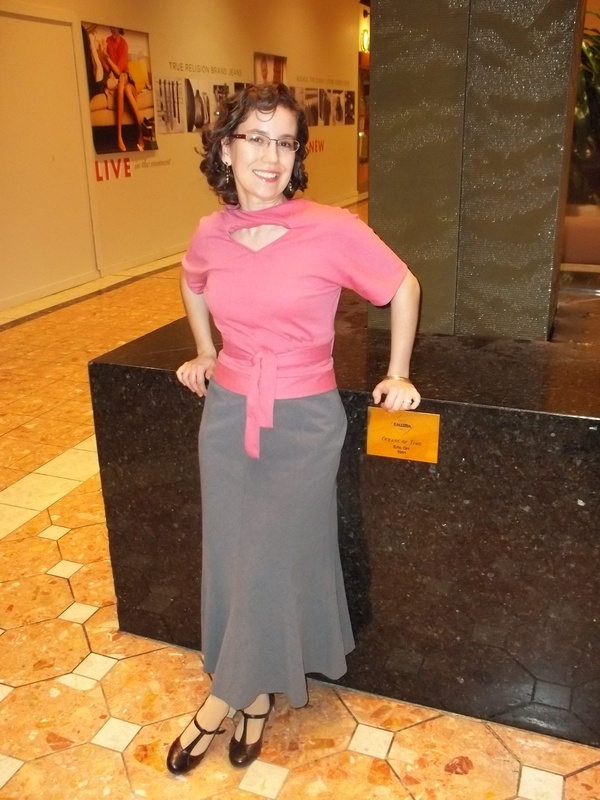 Just one last note: my skirt in the photos is several years old, from J. C. Penny’s, and my shoes are from a resale store. Nevertheless, my outfit is true to the 30’s, since my skirt is long and bias cut, while my shoes are T-straps with a deco design and a Spanish heel. 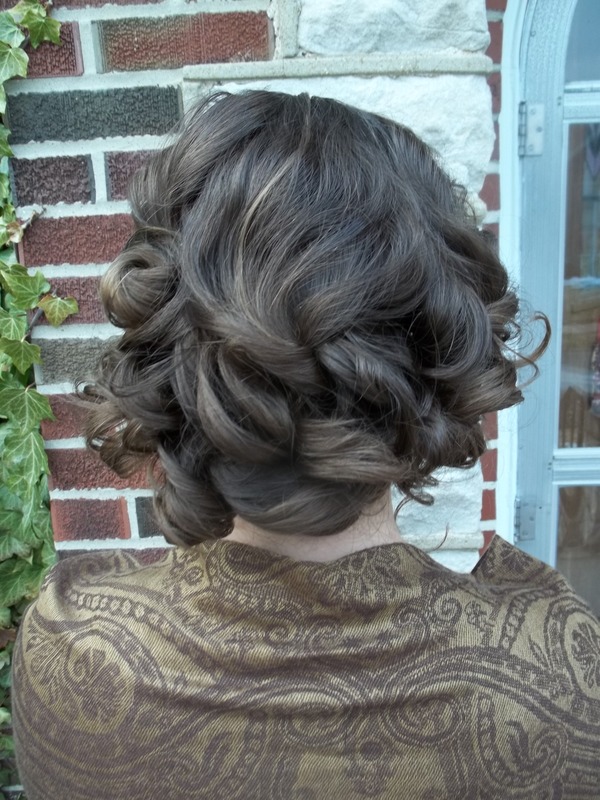 My fake 30’s bob turned out well…you can’t tell how much hair I tucked and pinned underneath. My outfit made me want to go dancing! 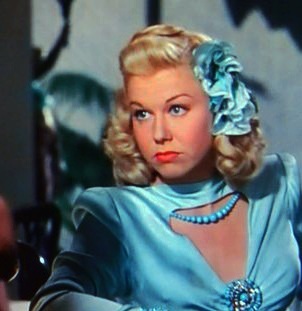 Have you ever seen the lovely Doris Day’s first movie, “Romance on the High Seas”? (If you haven’t seen it, you really should!) 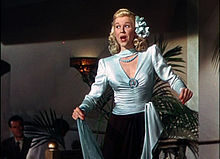 It was released in 1948, and for her first song in the movie she is wearing a strikingly similar version of my pink 30’s top – see the pictures. Her top looks like it’s a light blue satin with a wrap bottom waistband as well, except it has the classic 40’s sleeves…skinny, close-fitting with wide and puffy shoulders. This tells me A LOT about the popularity of this V2859 blouse design. For it to be worn in Hollywood over a decade later, reinvented for the current era, and worn for the debut of a rising star, already popular for her singing, means to me that this blouse design is more than just a cool pattern – it’s a fashion winner. Besides, it’s never a bad thing to feel that one has a little portion of classic Hollywood glamor in one’s wardrobe, right? Since last year when I began sewing more often (every week), re-making a pattern is a rarity. I like to use a pattern piece here or an idea there, incorporating a little of every other pattern into most of my projects. When I have a nice, full file cabinet of patterns yet to make, there has to be a real winner among them to deserve a reason for a repeat. I like variety in my clothing, and thus my favorite pattern remakes gladly look totally different. It actually feels quite nice to depart from vintage and explore my own modern, updated style! Both ideas surprisingly came from looking at a lot of 20’s to 30’s patterns and fashion posters after missing out on the Sew Weekly Gatsby Challenge in early September. 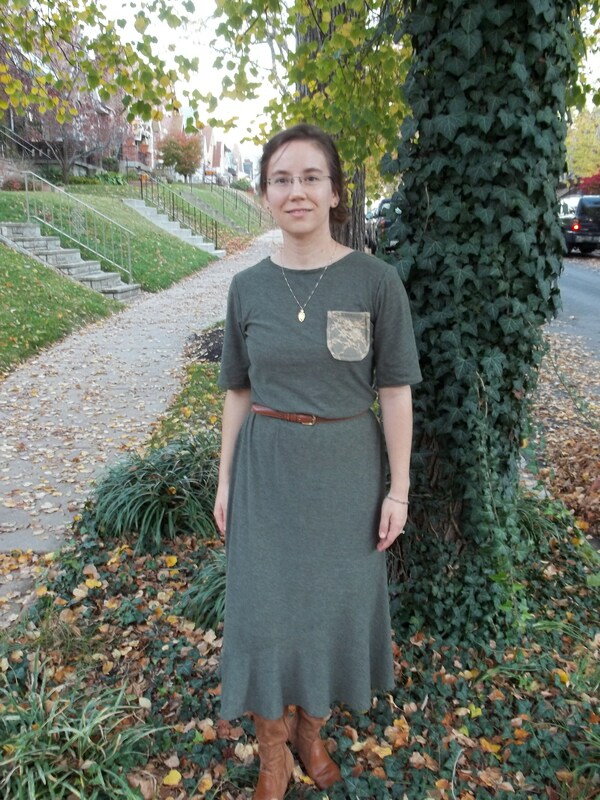 Here, I made a casual ‘Saturday’ t-shirt knit dress. It was made by magically combining two patterns together – a top pattern and a skirt pattern to turn into a dress. 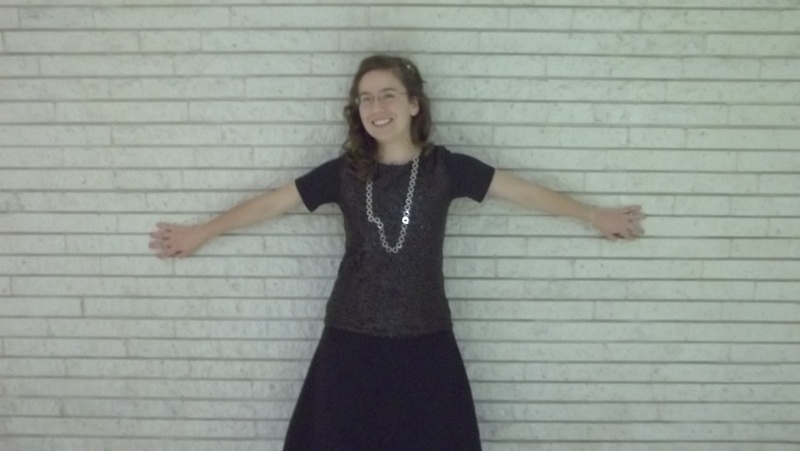 In this second picture, I made a fancy black sequin top, re-fashioned from an over-sized and sloppy knit t-shirt. 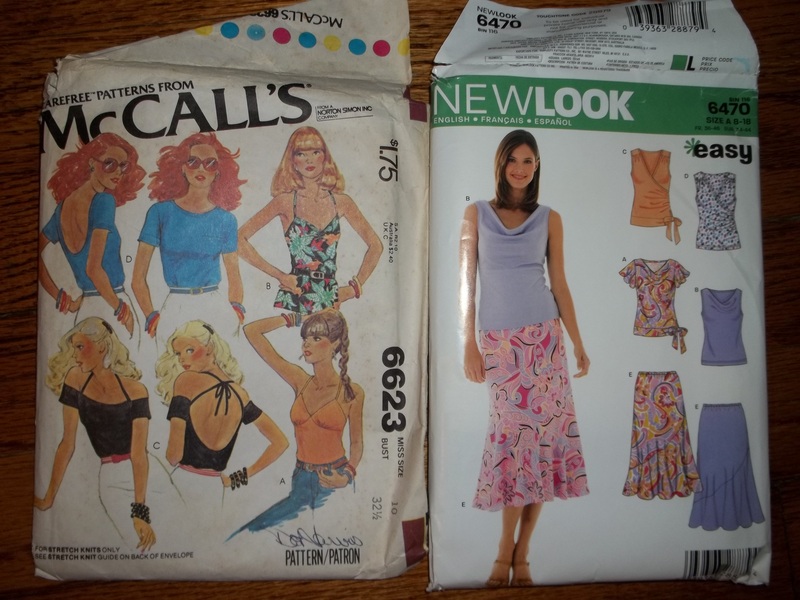 PATTERNS: McCall’s 6623, year 1979, for the top, made twice now, as you can see in this post. New Look 6470, year 2005, for the skirt (used three times now), to make two skirts back 10 to 7 years ago, and then for the franken-patterned dress in this post. 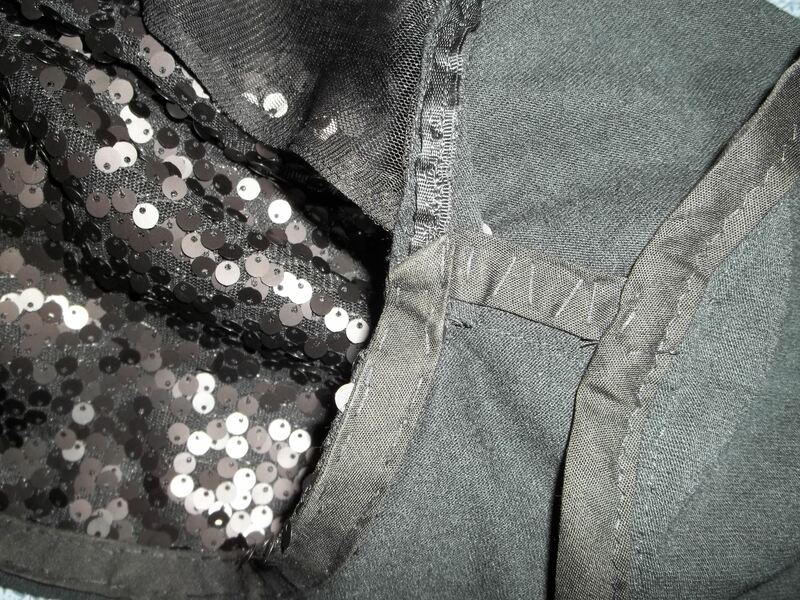 THE INSIDES: for the dress- just o.k., the seams are just zig zagged together nicely, as the knit fabric did not want to be ‘restrained’ too much into a nice seam; for the sequin top- I am so proud of this part! I sewed hem tape into the shoulder seams, sewed bias tape around all the other seams, and hand sewed a line of bias tape along the inside of the neckline, my extra work is SO worth it…because there is no itchiness! FIRST WORN: for the dress- worn on a Saturday outing to some antique malls to look for home stuff and old patterns; for the sequin top- over my Aunt and Uncle’s house for a Christmas get together. This is my new go-to fancy top for the holiday season. For both creations I did the same pattern combo. The New Look skirt pattern was used as a ‘benchmark’ for the perfect hip fit, since I’ve made it before. 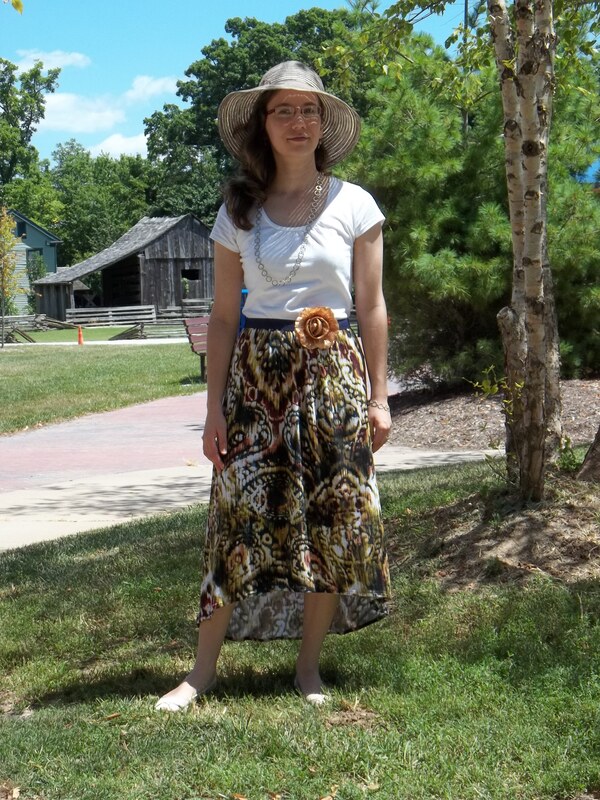 The skirt pattern was layered over my top pattern at 1 inch below the waist, as the skirt hugs the hips a bit. The cutting instructions were improvised by me in order to match with the layout of the top. The skirt piece is supposed to be cut on the bias. However, I simply folded the full skirt pattern in half to cut on the fold, coming out with a one piece dress or a great measurement for my top. I usually don’t throw cutting and grain line instructions out the window but it was a happy experiment. Then I just did free hand grading in between…I know where I need my clothes to be forgiving 🙂 You can see a little of what I did in the picture below. My T-shirt dress is remotely like Gatsby style day dresses that had a long bias ruffle slanted up one side of the hem. In early fall I actually had too many nice dresses, and I needed a casual dress that would stretch my sewing wings a bit further. When I finished my dress, I knew it wasn’t my coolest project, but I felt like I could really sew anything if I tried. At right is my very fun back detail. This super soft stretch lace solves any drooping of the shoulders on account of such an open back, and (I think) lends a special touch to what might otherwise be drab. I certainly find myself not wanting to cover the back up with a sweater! Besides, I needed a way to make a dent in a large cut of this stretch lace. I really don’t remember why I bought so much, but I am sure I’ll use it in some future projects again. 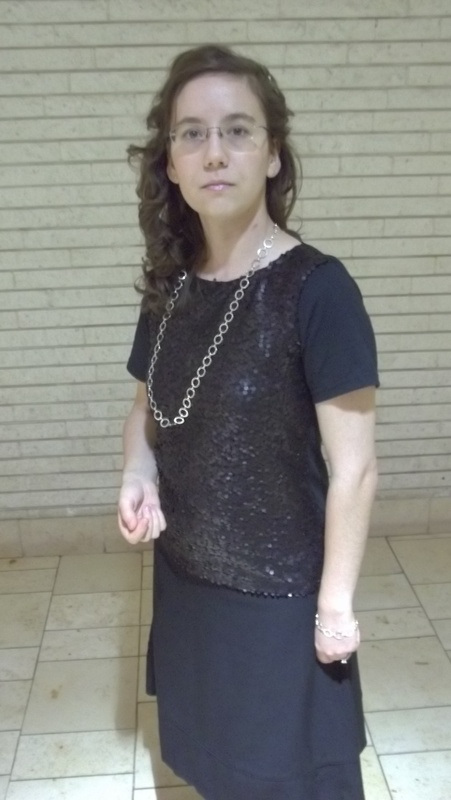 My black sequi n top was an idea spawned from admiring a Target sequin tank, and telling myself, “Hey… you can make your own better!” Soon after, I found an over-sized T-shirt while going through my old stuff. Then, I was crazy enough to buy bags of sequins and plan on (yeah right) sewing them on by hand, in a decorative Art Deco design. Wow…I am ambitious sometimes. At left is one of the ideas I was working from: a Chanel beauty of a 20’s dress. My plans drastically changed for the easier when I found a sequin-covered ‘fabric’ netting on a trip to the fabric store. I suppose it came in for the holiday/New Year’s sewing. I pulled it off the rack and couldn’t wait to get it cut and take it home. The fabric store employee might have had something there, when she hesitated to cut it, because cutting and sewing this sequin ‘fabric’ was so much more of a mess than any fur I have worked with in the past. The sequins would pop and jump at every cut I made, even hitting me in the face. Those sequins were sticking to my skin and left a messy trail everywhere I would work with my top. I found myself growing and murmuring complaints and breathing heavily while sewing or working with the sequin fabric. I know some sewing bloggers get driven into a very especially “unwelcoming” mood when working with sequined fabric, and now I can commiserate with them. However, I am not discouraged from sewing with sequins again! I will write this re-fashion story short and sweet. I cut all original seams off, keeping the sleeve hems. Then I re-cut the pattern top exactly as I did for my dress, and cut another front piece from the sequin fabric. The sequin front piece was pinned onto the T-shirt front, then I re-sewed the whole top back together, stabilizing seams. 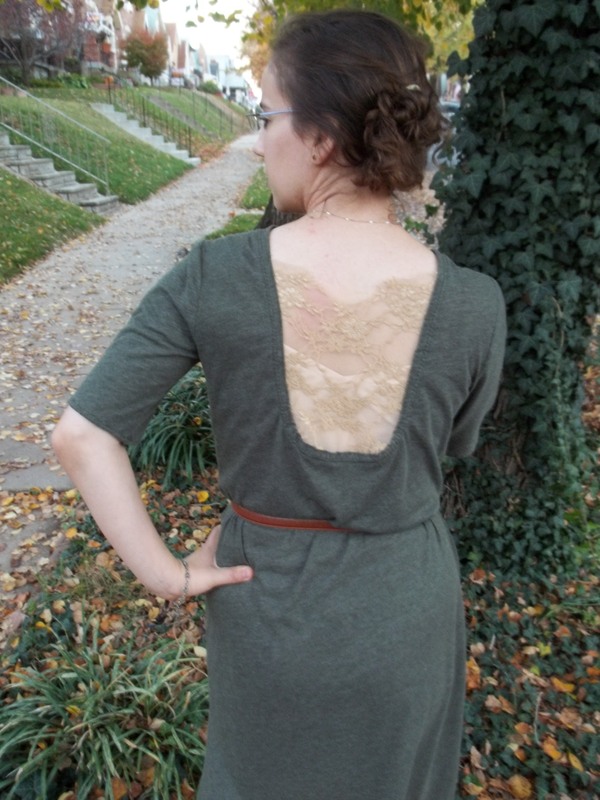 Next I used chalk to draw my own plans onto the back of the dress. I took advantage of the wide netting edge along the selvedge to fill in a large open back, similar to the lace in my knit dress above. Voila! 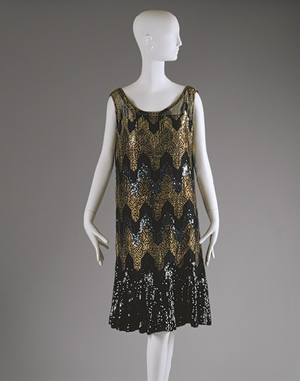 I like how it is, as it is, so I plan on using the sequin bags for another Art Deco type dress. I kept switching between needles the whole time I was piecing this together, using the sharp where ever I was sewing through sequins and using a knit ball point where I was only sewing on the T-shirt knit. I hope this was right, but I don’t see how I could have done it otherwise. Just a little FYI : I did a ‘sort of’ funny mistake when I finished sewing this top. When I was done, I was so excited to try it on and I completely forgot there was one last pin on the inside armpit seam. OUCH! I had one long, swollen scratch that luckily didn’t bleed much. My husband actually thought it was rather funny that my scratch was in the shape of the letter Z…the Mark of Zorro, maybe?! It makes me want to get out my old black and white Zorro movie…the 1940 Tyrone Power movie is my favorite! Here is an outtake of me enjoying feeling like a rock star! If I don’t post before the end of the year, Happy New Year everyone! Here’s to another great year of sewing ahead. Cheers!